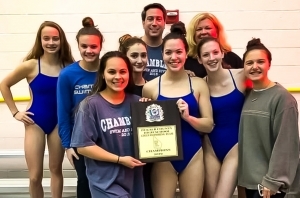 The Chamblee Lady Bulldogs won their first DCSD County Swimming and Diving Championship in 34 years with a 249-210.5 win over the four-time defending champions Dunwoody Lady Wildcats last Saturday at the Chamblee High Aquatic Center. Chamblee set three girls’ records, won six events and had 12 Top 3 finishes on the day that included 82 individuals and 25 relay teams hitting the state qualifying marks. Chamblee’s Jade’ Foelske became a six-time county champion by winning the 200-individual medley with a new record of 2:07.08 breaking the record of 2:09.57 set by Lakeside’s Katie Suhr set in 2006 and then going on to win the 100 butterfly (57:11) for the third time clocking a 57.11. Kyla Maloney added to the Chamblee collection with a win in the 100 backstroke with a time of 57:05 to break the record of 58.47 set by Druid Hills Lainie Bell just one year ago. Maloney also grabbed gold in the 500 freestyle with a time of 5:17.61. Foelske and Maloney teamed up with Teresa Maloney and Sophia Bell to win gold in the 200-medley relay and setting a new record of 1:50.77 to break the 2015 record of 1:52.15 set by Dunwoody. Foelske and the two Maloneys joined Anna Blankenship to win the 400-freestyle relay with a time of 3:46.14. Runner-up Dunwoody won two gold medals in the meet while claiming 12 Top 3 finishes along the way. Lauren Davis won her third consecutive county diving championship with an impressive 462.55 total in the event. Ainsley Jones picked up the other gold for Dunwoody by taking the 100 breaststroke with a time 1:07.59. Carlyn Slappey led third place Lakeside with a pair of gold medal performances. Slappey won the 50 freestyle with a time of 24.50 and the 100 freestyle in 55.58. The Lady Vikings also captured the gold in the 200-freestyle relay in 1:44.76. Fourth place Decatur’s finish was fueled by Halley Laney’s gold in the 200 freestyle (2:00.82). Lakeside finished third with 185.5 points followed by Decatur with 169 with Druid Hills in fifth with 74 out of 10 teams scoring points.